RÉSONAANCES: April Fools'11: ATLAS or CMS? One of them must leave! I knew it would come to this. Sad, but there was no other choice. You're not well informed. It's been already decided that CMS will vanish. I heard the opposite thing: CMS stays, ATLAS goes. April 1st arrives in Europe before North America. Actually they realized they didn't need full coverage in eta and phi, and LHCb was financially the best option to keep. 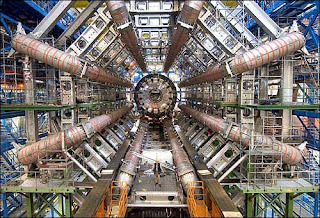 B used to be for b physics, now it is better known as LHC plan B. But what really makes me happy is Peter's change in direction. Now when my wife talks about my muffin tops I will check out what Peter's baking. I say, shut them both down, do it all with simulations. They're more accurate anyways. Off-topic: what do people think of ElBillug et al's new explanation of "the hump" as due to dark-matter super-chemistry? What a time for detectors to be closing! I've heard that they're both going. Instead they'll convert the LHC to a giant velodrome. The latest is that both are going. The date is April 1-st. The LHCb righteous will not accept the help of the general purpose pig dogs. May their stomachs roast in hell. Very, very sad indeed. I am slightly puzzled by the link though - it seems to point to the ATLAS Fast Track Simulation note. Could you comment? i heard they will collide two very low luminosity beams and the experiment that sees the first collision will stay. there is a paper by Holger Nielsen that suggests that only this one detector will be able to see sypersymmetric particles. Two experiments enter. One experiment leaves. "What started as a benign discussion about the missing energy resolution turned into a regular fist fight" - that sounds like any collaboration meeting, it's not a reason to close an experiment. I was told that the CMS will be eliminated. The reason is that this experiment has been harboring Tommaso Dorigo, a blogger. Once this was noticed by Rolf Heuer, the CERN director general, they didn't hesitate. See Dorigo's blog. He quit blogging and, fortunately, will be arrested tomorrow. 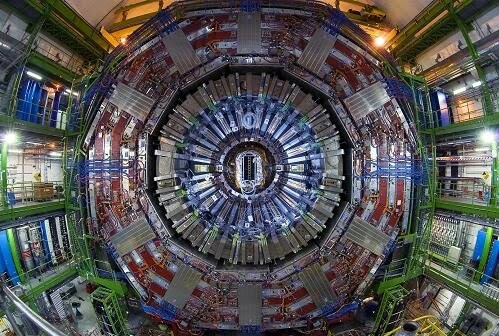 In fact, the reality is that US Government decided to support LHC experiments financially and upgrade Tevatron. That's what is not said publicly. Two Experiments: But which one's best? There's only one way to find out...FIGHT! The inofficial plan is to dig out the whole LHC in one piece and move it to Fermilab once Tevatron shuts down. The current dispute about ATLAS or CMS shutdown is a preparative measure just to make people happy when both continue operation in the US. Why is all the traffic on this dated April 1st? Can't they just collide the two machines together and see what's left? I'm writing from deep within the US CMS group war bunker...It's already too late for ATLAS. 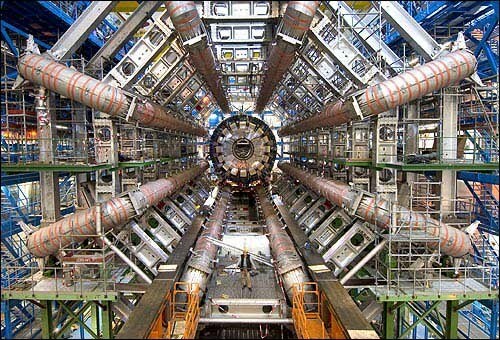 We've used our 2nd Amendment rights to obtain large stockpiles of weaponry and have transferred it to CERN. The insurrection is coming. It's now been confirmed that ATLAS is to become a children's adventure playground with the addition of a waterfall and a pirate ship, and CMS is to become part of the Pompidou Centre for modern art. I think this is reasonable. ATLAS must leave, I don't like ATLAS's logo. This may not be an April Fool's joke. Many people who work for ATLAS and CMS visit Lubos Motl's blog, which is a hub for hateful, sexist, ad hominem attacks and insults against people he chooses. It's possible these visitors to his blog are being inspired by Lubos' posts. Adam, you had me LOL'ling all the way! Lubos, if CMS is dismantled I don't mind taking a vacation, even behind bars ! I've always liked your humour. But now I think I'm in love.